this is it. you opened this recipe, which means there is no turning back. you are committed to making one of the most delicious foods in the world. and no, that isn’t my opinion. it is just a little known fact. imagine ravoli. now imagine that instead of being square with foppish, frilly edges, they were beautifully round and pinched into a form similar to tortellini. then imagine instead of ground beef and breadcrumbs, they were filled with a combination of onions, garlic, dill, pork, beef, salt, and pepper. then imagine that instead of mediocre marinara sauce, these beautiful dumplings were swimming a bowl of golden consommé, topped with a massive dollop of sour cream, and heartily sprinkled with dried dill. i think you are starting to understand. let’s get down to it. you need to know a few things before you start. first, don’t plan on making twenty of these little guys and then calling it quits. 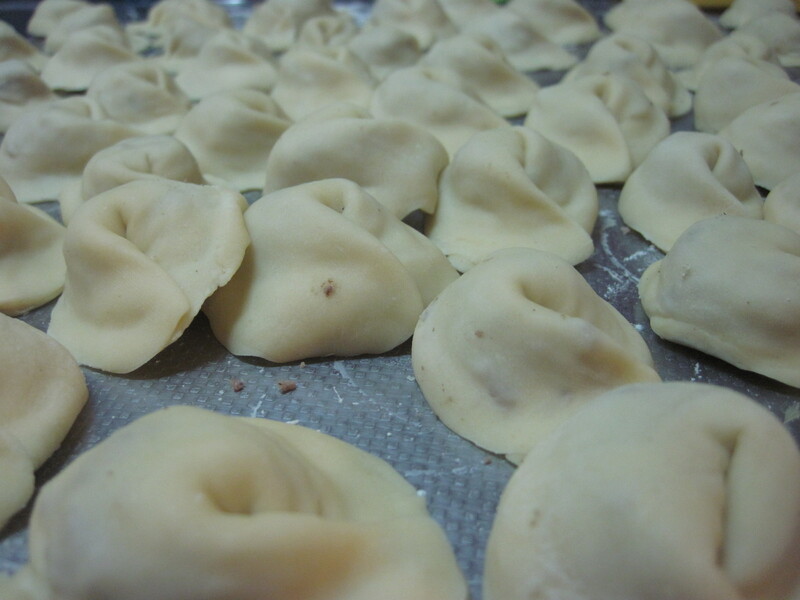 there is a significant amount of preparation required to make pelmeni correctly. don’t commit unless you are willing to follow through. second, because making pelmeni is so labor intensive and time consuming, don’t try to be a hero. you most likely will not be able to do everything by yourself the first time. get a russian friend or someone who has made pelmeni before to help you, or get some friends to go in on the endeavor to share in the labor. all disclaimers aside, let’s do this. peel your garlic and onion. mince both super finely. consider that this will be part of the filling of your pelmeni. large chunks of raw onion and garlic will poke through the thin dough encasing them, so do your best to minimize the possibility of that happening. put both into a mixing bowl and combine with your minced meat, salt and pepper to taste, and a bunch of dill. should you feel the need to season more, you can add a pinch of ground coriander, but other than that, try to leave the mixture as it. take a small pinch of the meat and fry it in a pan to get a taste-test. once satisfied, cover the bowl containing your filling with saran wrap and place in the refrigerator for at least 30 minutes. the purpose of this is to both firm up the texture and to allow the flavors to set. while you are waiting, let’s make the dough. sift about a cup of flour into a large mixing bowl. add a pinch of salt and stir. form a well in the middle of the flour, and crack one egg into the well. break the yolk of the egg with a spoon and stir it into the flour. gradually add heavy whipping cream while stirring until the dough begins to firm up. adding a spoonful of sour cream (or strained yogurt) will help the dough reach the appropriate stretchy texture more quickly. flour your hands and start to kneed. once the dough starts to firm up a little, turn it out onto a well-floured surface and begin going at it with your hands again. when the dough looks and feels smooth and stretchy to you (without being too sticky), it is ready to be used or saved. keep in mind that a ball of pelmeni dough can be wrapped in a slightly damp cloth handtowel and put into a sealable plastic bag. in such conditions, it can last in a refrigerator for a few days. in our case, you are going to use it right away, so start rolling it out with a rolling pin. your goal is to roll the dough as thin as possible without breaking or creating irregularities in it. keep at it, it’ll take some time and arm strength. 1 to 1.5mm thickness is just about perfect. progressively flour the surface of the dough and your rolling pin to make sure there is no sticking or ripping. once rolled out, use a cup or small bowl to cut circles into the dough. each of these rounds will become one dumpling. make sure to cut circles from the edge of the sheet of dough, and do you best to waste no space between the circles. set the dough circles aside on a plate and make sure they do not stick to each other. take out the meat, and prepare a spoon and a small bowl of water. the time has to come to test your mettle. take a dough circle in hand, add a small spoon of filling in the center, and fold the dough over to create a half circle. this is important, so listen. do not overfill the pelmeni. an overfilled dumpling will rupture when it is boiled, which is just a waste. in this case, less is more. pinch the edge of the half circle shut with your fingers. don’t be dainty, really slam it shut. if it isn’t appropriately sealed, the filling will bust of the hole as soon as you start the boiling process. if the dough is a little dry or over-floured, the half-circle will not stick when pinched shut. in such circumstances, dip your fingers in the small bowl of water and try again. you don’t need to drench them, just get them slightly damp. once sealed, take one pointed end of the half-circle in each hand and overlap, pinching hard to seal the two ends together. the result should be something that looks very similar to a tortellini. set it aside. repeat steps 9 and 11 another 100 to 200 times. the beauty of pelmeni is that once you have formed them, they can be floured and put in a plastic bag, and they are 100% okay to freeze for quite some time. moreover, they can go straight from the freezer to boiling, well-salted water, which makes them an ideal snack to have on hand for busy people (or for people who become ravenously hungry with a only a moment’s notice). fill a pot with water, add a little salt, and bring to a strong boil. add ten or twelve pelmeni to the water and stir. make sure that they pelmeni do not stick to one another or to the bottom of the pot. cover and let cook until they have bobbed to the top of the water twice and remained there. scoop out with a slotted spoon and place in a deep plate or a soup bowl. prepare some chicken stock or consommé, and it ladle over the pelmeni once nice and hot. top with a dollop of sour cream and a generous amount of dill. surprise yourself and others with your new found pelmeni making skills. making pelmeni is great because you can actually involve your dinner guests. it is as much about the result as it is the process. and let me tell you, the more time you spend making an huge surplus of pelmeni, the better they taste (especially among friends or family). you get out what you put in, so have fun. makes enough dumplings for a 4 person feast, with some to freeze for later. pelmeni. what? pelmeni go well with pelmeni? what does that even mean? well, what it means is that pelmeni can be cooked all kinds of ways. pelmeni can be served in chicken consommé as mentioned above, or they can be basted with butter and baked. they can be boiled and then pan-fried until crispy. they can be deep fried. they can be boiled and served in melted butter and garnished with dill. if you have a whole boatload, try making a pelmeni sampler. guests might like to try the myriad ways in which pelmeni can be delicious, and all the methods of preparation could be a dream for creating a truly beautiful plating presentation. peroshki and vareniki. the dough of pelmeni can be filled with more than meat. russians make all manner of variations. i love a good mixture of mashed potato-filled peroshki along with pelmeni in my dish of consommé. and when dessert time rolls around, a few blackberry jam and cream cheese filled vareniki served in a butter sauce with some honey (or granulated sugar) hit the spot. just keep in mind. vodka. it’s russian food. say no more. salat olivier. hearty food calls for more hearty food, and salat olivier is second to none when it comes to rib-sticking goodness. crank up the air conditioner while eating a piping hot bowl of pelmeni and a hearty serving of salat olivier, and you might just feel like you are on vacation in siberia. send me a postcard. black bread. toast it, or don’t. it doesn’t matter. either way, you can soak it in the broth that remains once your pelmeni are eaten. waste not, want not.